This Year's Boy | My name is Zach. I fight crime. My name is Zach. I fight crime. So I was talking with my friend Brandi Wells the other day about poems. Brandi generally doesn’t like poems, or doesn’t like a lot of poems, but I do like poems, or at least I like some poems. Anyway, we weren’t actually talking about poems; we had started with a discussion of her book/chapbook Poisonhorse (which has a bear on the cover, not a horse like you’d expect) and about how one of the lines from her book became one of those things that lodged in my head and wouldn’t go away for a while, a lot like the Stevie Smith poem, “Not Waving, But Drowning,” which is a poem that I have been thinking about for years. I then mentioned that the Stevie Smith poem was one of my top 10 favorite poems. Brandi told me that I had to provide a full top 10 list of my favorite poems, which I promised to do, but it was an empty promise, friends. I don’t think I ever really intended to do this, because having favorite things is difficult. It feels like committing to something. However, I am somewhat blocked today, and I think it would be a good time to think about why I love poetry and what poems I love. I feel like I should also defend myself by saying that I don’t think that all of these are necessarily the best poems, or even particularly good poems. They are merely poems that I have, for one reason or another, remembered, or that have stuck with me, or that I read in undergrad when everything seemed very important and worth keeping in my mind for all of time. I would also venture that a certain number of these poems are exquisite. 1. “Some Rain” by Joy Katz. I am very interested in the immediacy of history. Also, I wrote a poem once that was a lot like this poem, without ever having read it, and while it was disappointing when I discovered it, it also fostered some sense of kinship. 2. “You are Jeff” by Richard Siken. This poem shares some space on this list with “The War of the Foxes,” also by Richard Siken, which I also love. I return to them both a lot. I like the quality of Siken’s line, how he is somehow both very terse and very expansive. 3. “Not Waving, but Drowning” by Stevie Smith. I feel a little bit like this poem is about my life, and I think that’s how a poem should feel, or should feel sometimes. 4. “The Glass Essay” by Anne Carson. This is a very long poem, or maybe it could be considered a bunch of poems, but I don’t really consider it that. This is not about my life, I think it’s a little bit about everyone’s life. Of course I should also say that I love Autobiography of Red, also by Carson, which might also be my favorite, if I can be permitted two favorites (let’s say that I can). 5. “The Love Song of J. Alfred Prufrock” by T.S. Eliot. I think when you talk about Eliot, and how can I not, you can talk either about Prufrock or you can talk about “The Waste Land.” Frankly, I like them both, but for different reasons, and I spent much of my life really wanting to be able to do Eliot as well as Eliot did. At least in terms of writing. I hear he was a miserable person. 7. “Boonies” by D.A. Powell. I read D.A. Powell a lot when I was in undergrad, but not later in undergrad, but earlier. I was 21 or 22, maybe. I was so impressed with his writing. This is not his strongest poem, but when I encountered it in an issue of Poetry last year (or maybe the year before), I thought it was lovely. For a better idea of what he’s all about, you could also read “[listen mother, he punched the air: I am not your son dying].” It is a better poem, let’s be real here. 8. “The Triumph of Achilles”by Louise Glück (sorry, that website is The Worst). When I say “I like Louise Glück,” what I really mean is “I like this poem.” Also, I like a lot of her other poems, if we’re being totally fair. But this one stands out and I have known it for, it seems, as long as I can remember. 9. “Bright Star” by John Keats. Ok, truth be told, I like this poem just because knowing it has actually gotten me laid. I think I probably like “The Eve of St. Agnes” more as a poem, but . . . I also like romance a lot. Also, everything John Keats wrote was beautiful beyond reproach, so I could have said anything. 10. “Her Kind” by Anne Sexton. I’ve always had a very soft spot in my heart for Sexton, being, to my mind, the most overlooked of the confessional poets. She has always been my favorite, though, and maybe it’s her very roughness that appeals to me most. Oh, um, also Sonnet 130 by Shakespeare. Just read it; it is hilarious. That wound up being a lot more than 10 poems. If you actually read them all, I commend you. 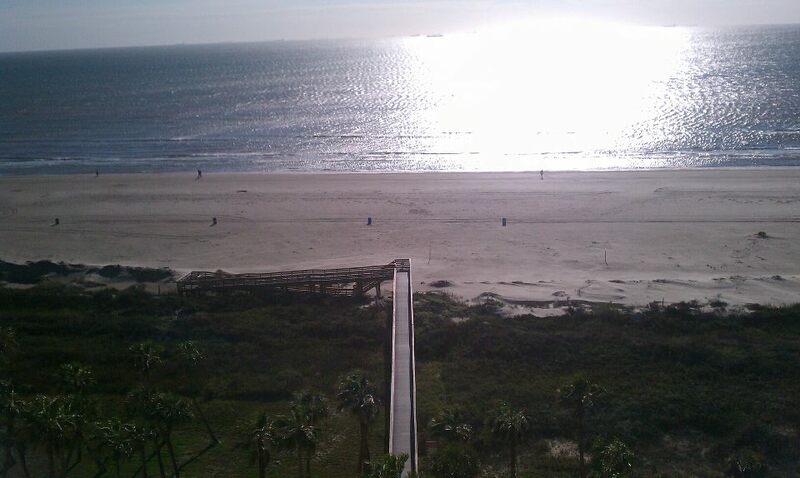 I woke up on January 1, 2012 to see the totally uninterrupted sky and the sea and the sun shining. Everything was blue and bathed in light. It was, I felt at the time, a sign of good things to come. I still feel that way. I am going to share something here that I haven’t told many people, for a variety of reasons: in early December I applied to grad school in creative writing. I only applied to six schools before I burned out and quit applying. In the creative writing world, that’s basically a no-go; the majority of people apply to 10 or more schools, and for a lot of people it takes years to get in. Creative writing schools are highly competitive, many of the more selective schools receiving hundreds of applications but only accepting very few applicants. I was rejected by two schools very promptly, so I did not have good feelings about my chances. So imagine my surprise when I actually got in. I was accepted at the University of Alabama, and put on the waitlist at the University of North Carolina at Greensboro. In late February, when all of you were getting “out of town” email replies from me, I was in Tuscaloosa, Alabama, being recruited for their program. It’s really a special feeling, knowing that somebody likes your work enough to pay for you to fly to Alabama so they can convince you to let them pay you to go to school there. Yesterday, I accepted the University of Alabama’s offer of a position in their program. I still had one school that I haven’t heard from, but I knew in my gut that Alabama was the place I wanted to go. From the beginning, it was my number 2 choice of schools, so when I got in it just seemed like fate. Visiting sealed the deal; I felt like I belonged there, and even though I only got to know people for like 3 days, I feel like I did make some friends. But, as I’m sure many of you have grasped, this also means that my days in Houston are numbered. That’s hard for me to get my head around. For the last 8 and a half years, Houston has been home. I have made incredible friends here, life-long friends. I’m still going to love most of you in 10 years. But more and more I realize that it’s time for me to do something new. Ultimately, the change is not so drastic. I’m going to a place very much like the place I live now, but farther away and smaller.